The Mahim Causeway and the Dharavi bridges are among the 10 that will be rebuilt as part of the Mithi Development Project. The 170-year-old bridge at Mahim Causeway, one of the oldest links between the city and the suburbs, might soon be razed to make way for an arch bridge. With the civic administration currently awaiting a nod from the Ministry of Environment & Forests (MoEF), the Mahim Causeway bridge will soon be demolished under the Mithi river widening project. Meanwhile, the Brihanmumbai Municipal Corporation (BMC) has begun the process of appointing consultants for a single-arch bridge. “The proposal for the demolition of these bridges, including the Dharavi bridge, had been sent to the environment ministry for final approval in June last year,” said S P Kori, chief engineer, bridges department. He added that the department has simultaneously begun the work of floating tenders to appoint consultants for the project. The Mahim Causeway and the Dharavi bridges are among the 10 to be rebuilt as part of the Mithi Development Project. Each bridge will be made wider. 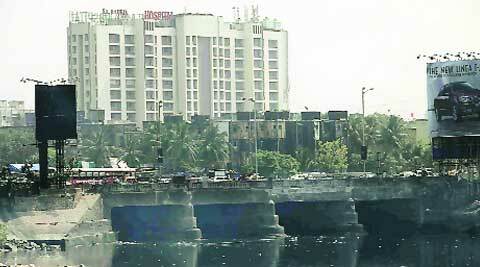 The construction of 10 bridges will cost of Rs 316 crore, including Rs 70 crore for the one at Mahim Causeway. The causeway now has five lanes, two leading to the city and three to the suburbs. The new bridge will be designed to have five lanes on either side, said civic officials. However, with the existing traffic situation, the demolition and rebuilding of the bridge will be done in phases, said officials. “It will be difficult to divert traffic to another route, so part of the bridge will be demolished in the first phase and the traffic diverted towards the other side. In the second phase, the rest of bridge will be demolished and rebuilt,” said Kori. Civic officials said that the new bridge will have an arch on either side. “The bridge will also have walkways and a footpath for pedestrains on either side,” said a senior civic official. Under the Mithi project, desilting, deepening and widening of the river, besides construction of a retaining wall, is being undertaken by the BMC along CST bridge, Kurla-Kalina bridge, Ashok Nagar bridge, Bamandaipada bridge, Kranti Nagar bridge, Dharavi bridge, Tansa and Vaitarna pipeline bridges and the Mahim Causeway bridge. The causeway was built between 1841 and 1843, 32 m wide, at a cost of Rs 2.04 lakh, including Rs 1.56 lakh donated by Lady Jamsetjee Jejeebhoy. In 1941, the bridge was widened by M/s Zakariya Dawood & Co Bombay by Thana division of PWD at a cost of Rs 1.87 lakh, which included Rs 22,533 from the then Bombay Municipality.